If you are planning to do some podcasting or music recording, you might be in the market for a USB microphone. Large Diaphragm microphones are great for capturing a full sound of a vocal or instrument. They can also be placed to capture an area rather than right at your mouth. We’re looking at two Large Diaphragm USB microphones – The Monoprice 600801 and the IK Multimedia iRig Mic Studio. I am recording straight from these microphones with no post-processing. Levels will be different but you should be able to hear the results each microphone gives. BTW – I did get product from both Monoprice and IK Multimedia but opinions are my own. 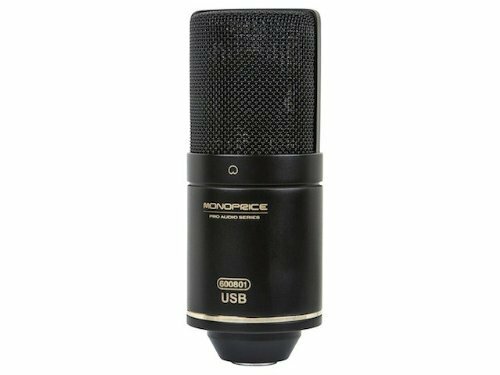 We’ll start with the Monoprice 600801 USB mic. This is a 6-micron sputtered diaphragm with a 22 mm capsule. The microphone records 16-bit 44.1 kHz/48 kHz audio. The USB-B cable allows for connection to PC or Mac, however it will not connect to an iOS device because it uses too much power. There are no controls on the 600801. You have to adjust volume through your input area on the PC or Mac. The microphone with stand is 2.36″ x 6″ high. You can adjust the tilt, but if you need height, you’ll have to attach to another microphone stand. You will also have to buy a shock mount separate. The sound from this microphone is great for a Youtube voiceover. 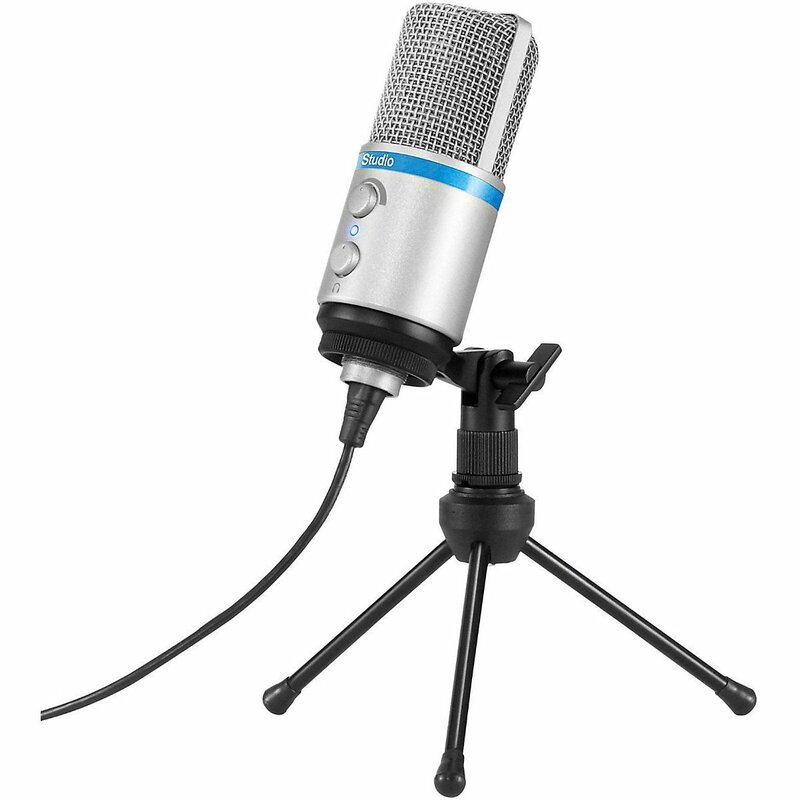 For around $75-$90 you get the microphone, stand, a 15′ USB cable and padded case. Prices do vary through time and demand. One issue I found is a hum in the mic, especially if you hold it. This did not happen on the Mac, so not sure what caused the hum. The iRig Studio microphone from IK Multimedia has more features and does allow for iOS or Android connection. The iRig Studio is smaller than the Monoprice and also has a pre-amp inside so you can adjust from the microphone. You can also connect headphones through the back. Both of these microphones have a response frequency of 20 Hz to 20 kHz, which makes this perfect for capturing instruments, and any range of voices. The iRig Studio can record in 24 bit 48 kHz. The capsule is back electret, which is a different type of capsule that uses less power to keep charged. Your old Landline telephone receiver, for example, is a back electret condenser. But don’t worry – the technology has advanced from the 70’s and electret capsules give out a better sound. The iRig Mic Studio will cost you more at $179. For the extra features, size, and ability to connect to iOS or Android, along with apps that can change the sound of the microphone, the studio will do you well in recording. But let’s listen to the microphone a little more. In all, both of these microphones have a good sound and are pretty solid. The iRig Studio has more functionality, whereas the Monoprice 600801 is great for putting on a shockmount stand and using for many different ways.